Here’s everything you need to know about law school interviews–what they are, how to prepare for them, and what to expect. Note: Registration is already open for many law school interviews! What is the purpose of the interview? In addition to admission, law schools might use the interview to screen candidates for scholarships, research opportunities, or special programs such as law school ambassadors. It is definitely worth an applicant’s time and effort to take the interview seriously. Research your law schools’ websites to see whether and what format of interview is offered. We posted a list of known interview types by school over on our Compass page. Group interviews–Some schools like Georgetown will offer group interviews in selected cities. Visit their website here for details and to register. By invitation only–some law schools like University of Chicago choose to interview applicants after applications are submitted and by invitation only. Recorded interviews. Some law schools are now offering applicants the opportunity to record an interview. Usually this is how it works: You are given a prompt, and then 2-3 minutes to think about that prompt. Then the webcam records you for a few minutes while you give your answer to the prompt. TIP: Make sure that you look professional and are in a quiet place without interruptions. Also, take a picture with your webcam before the interview so that you can see what’s behind you…you may be surprised to see that pile of laundry or unmade bed in the background. Do your research. You should expect them to ask you “Why this law school?” and they will want to hear specific answers. Take a careful look at the school’s website, employment data, and social media. Do be prepared with specific talking points about the school that interest you: A particular journal, clinic, moot court, externship, or certificate program is a good example. Avoid general platitudes like “you have a national reputation” or “you’re the best ranked school I can get into.” They want to see that your interest goes beyond their ranking. Carefully review your resume and be prepared to discuss anything on it. Many schools will also ask something like “What are your career goals?” or “Where do you see yourself in 5/10 years?,” or even “Why do you want to be a lawyer?” and you should be prepared to discuss your career interests. Decide how you will address the inevitable “What are your strengths and weaknesses” question. Behavioral interviewing. This mode of interviewing will ask you to “Tell me about a time when…” For example, you’ll be asked to tell about a time when you resolved a conflict, managed a team project, made a mistake, or made a big decision. Practice. Sign up for a mock interview with Career Services, or have a lawyer/professor/trusted person sit down with you and ask you mock questions. Think carefully about what you want to say, and how you can best convey it. DO NOT BE LATE under any circumstances. The biggest sign of disrespect to lawyers is wasting their time. Allow yourself plenty of time for parking/traffic/restroom. If you absolutely cannot avoid being late, call the office to let them know. Dress up. This is not a business-casual situation; business formal is best. Engage in small talk. How’s the weather, what a lovely office/view, how is your semester going, etc., is not only socially necessary but also gives the interviewer an idea of how good you are at making people feel comfortable talking with you–a critical skill to be a successful lawyer. This might even be part of the interview itself. What are the most important qualities in a Law School X student? How would you describe the student body/atmosphere here? What challenges do you see current law students facing? What’s the best advice you have for an aspiring law student? Thank the interviewer for their time. Reiterate your interest. Follow up with an email thanking the interviewer for their time. Thank you for your advice about _______________; I found that very insightful. It was so interesting to hear your perspective on the unique qualities of this school. I appreciate your candid advice for prospective law students. Take the opportunity–again–to reiterate your interest in the school. A Spring/Summer 2019 Internship Plan–starting NOW! We’ve barely kicked off fall semester and it’s time to look for 2019 summer internships? In a word…yes. The number one mistake we see time and time again is this: Students waiting until spring break to look for summer internships. They can’t find any, or deadlines have passed on the ones they have found. Certainly there are some companies and programs that will do their summer hiring in late spring. BUT if you wait until spring, you will be giving up MANY opportunities to participate in great internships. Some companies and government agencies plan far in advance and already have a summer hiring plan. For example, the White House Internship Program has already finished taking applicants for Spring 2019. Many federal internships will only accept the first 100 applications–so you need to be ready to apply ASAP when it opens! What is a good plan? Subscribe to internship websites. You can set them to email you a weekly digest, or just email you when the kinds of internships that you designate become available. Some suggested sites are listed below. Use Handshake. The Career Center uses Handshake to post jobs and internships for Illinois students and alumni. Click on the link below, log in, set up your profile, explore, and set it to contact you when internships you qualify for become available. Check back regularly. Attend Career Fairs. Did you know that most campus career fairs, like the Business Career Fair and the ACES + LAS Career Fair, are open to all students? And, many of those employers will have both job and internships available. You can find a list of all campus career fairs on Handshake. Create or perfect your resume. The Career Center has numerous opportunities to have your resume reviewed–or attend a resume basics workshop–every week. Click here to see their events. You’ll need a resume for the rest of your life, so the sooner you start building these skills, the better! Aim to have a good quality resume by mid-September to avoid delay applying for the internships or scholarships that you find. Gcal or Ical it. NOW–right now–go to your Gcal, ical, or good old fashioned planner, and schedule an hour every other week (or every week, if you’re very ambitious) for Internships. (Use this time to check internship listings and prepare your applications.) When you find an internship listing, add that due date to your Gcal/ical/planner too. Finding and applying for internships and jobs is not done in an afternoon–it really helps to be organized and persistent. What internship websites should you use? Here are the Top 5 Internship Sites that we have found to be helpful. Handshake–Here is where companies post their opportunities for Illinois students. You can also find out about upcoming company info sessions and career/internship fairs. USAJobs.gov–for federal government jobs and internships. Tip: The website gogovernment.org has a nice overview explaining how to get started and what to look for. Each semester, we post a list of upcoming courses that will help pre-law students develop relevant skills for law school and get a taste of what studying law is like. What else should you know about building your pre-law schedule? This Guide provides several tips and suggestions to help pre-law students make the most of your upcoming semesters. Pre-Law students really can major in ANYTHING and be successful in law school, but you must be a strong student in whatever you choose. Therefore, carefully consider what major(s) and minor(s) will challenge you but also allow you to demonstrate your academic strengths. Explore all majors and minors on campus here. What academic skills should you build? Pre-law students must demonstrate strong research, writing, reading, and speaking skills, which can be accomplished both in and out of the classroom. These are the core skills that law schools truly care about, so take a look at your DARS and ask yourself: How many courses have you taken that develop and reflect these skills? Take courses that demonstrate those skills–they can be in any discipline. Popular options include English, History, Political Science, Philosophy, or Communication courses, but don’t feel limited to only those. Balance academic challenge with success. Law schools want to see students who demonstrate academic success while taking a challenging courseload. Ideally, pre-law students would take an academic course load that is challenging both in terms of rigor and credits while still doing performing well. What does this mean, and how can you achieve it? Be strategic in your course selection. Don’t take your 5 hardest classes in the same semester to get them out of the way. Work with your major advisor to determine how you can distribute those courses throughout your remaining semesters. Likewise, don’t take your 5 easiest classes at the same time–use those to give you some relief from the harder classes each semester. For juniors and seniors–Move up from 1 and 200 level courses to 3 and 400 levels in order to demonstrate an appropriate level of challenge. A good general rule is no more than one 1 or 200 level course per semester for juniors and seniors (unless you must do so to graduate on time). Taking easy classes to pad a GPA is obvious to law school admissions, who know what a challenging semester looks like. Use your major(s) and minor(s) to complement each other. If you have a major that does not necessarily demonstrate lots of writing or research skills, then selecting a minor or secondary major that does is a smart balance. Unusual combinations of majors/minors can also show a law school someone who is intellectually curious and able to succeed in a wide variety of coursework. Consider changing majors, especially if you are not able to achieve mostly As and some Bs in your coursework. This is especially important if you struggle academically for more than one semester–it is very challenging to fix a low GPA once obtained. I just wanted to hurry up and graduate so I took a very demanding overload each semester. What, then, are good reasons to take a course? I talked with my academic advisor who agreed it is a good fit for me. You must prioritize academics if law school is your goal. Don’t get distracted from your goal of law school admission. If being president of a social organization or volunteering too much affects your grades, it’s time to dial back your extracurriculars and rededicate yourself to your role as a student. Law schools will not care that the reason your grades suffered is because you were planning a big fundraiser…that shows them a lack of prioritizing and time management skills. Build important academic skills. Right now you are building academic skills and habits which you will rely on when you transition to law school, where the work is much harder and infinitely more time consuming than your undergraduate studies. Now is the time to master discipline (not procrastinating), effective note taking, reading comprehension and speed, attention to detail in your writing, citing your work appropriately, giving an effective speech, and managing your time. All of these are skills that you will be expected to bring with you into your law school classroom. Plan far in advance for study abroad, Illinois in Washington, and taking the LSAT. Most students try to lighten their academic load during the spring of Junior year or during the fall of Senior year while they prep for the LSAT. Studying for the LSAT will take about 10-15 hours per week for 4-6 months. Review upcoming LSAT dates and deadlines here. If you are planning to study abroad or do Illinois in Washington, talk to a pre-law advisor about planning your LSAT options around those. Monitor your academic performance and seek help. Don’t wait until the last week of class to discover that you are actually not earning an A. Seek help when you need it–this University abounds with programs and services to support your academic endeavors! Start by talking to your TA/Professor and your academic advisor about academic support and tutoring options. Remember that grade replacement will not help for law school (click here for a refresher), so take the time to carefully consider your best course options and seek help when you need it. Planning to take the LSAT in 2018? You need to read this. If you are planning to take the LSAT in 2018 then you likely already know that we’ve seen some MAJOR changes recently! Here come some more. Here’s what you should know if you are planning on taking the LSAT in 2018. 2. June or July? The LSAC very recently decided to add the July exam to the schedule and currently both the June and July registrations are open. So if you are planning to take the LSAT this summer, theoretically you now have the option of July instead of June. Note: the July LSAT is NONDISCLOSED, meaning that test takers will only receive a score and not a full score report showing answers. Although July test locations have not yet been posted to their website, we have received confirmation from the LSAC that there WILL be a July LSAT on our campus. 3. June AND July? Probably not. If you are considering taking the LSAT twice, June and July are not going to be easy to accomplish. Why? 1) You will not get your June LSAT score until after the July registration deadline has passed; 2) June LSAT takers will not have enough time after getting their June LSAT score (typically around the 4th of July) to re-prepare and be fully ready for the July exam. For a better strategy, see #5 below. 4. June and/or July LSAT takers—It’s time to register and start studying! Registration is open for both exams here, and we encourage you to register early. Typically the June exam fills by spring break, and with the increase in LSAT takers we expect this one to fill even sooner. July is brand new so we don’t know when it will fill, as locations have not yet been announced. When should you start studying? NOW. We recommend 4-6 months to fully prepare for the LSAT, so now is the time! Most LSAT prep courses for the June exam will begin in early March, so research your options and sign up for the class that suits you best. Not sure which LSAT prep course to take? We recently hosted the LSAT Prep Fair for this, and you can find links to participating LSAT prep companies here as well as a list of LSAT prep options and resources over on our Compass page in the LSAT Preparation folder. 5. Plan ahead for retake options. Basically the new LSAT schedule offers an LSAT every other month. These LSATs are not designed to be taken back-to-back, and it is unlikely that any LSAT taker would have enough time to prep for a retake by taking the very next LSAT. (For example: June and July, or July and September). Remember that every LSAT score gets sent to every law school you apply to, so it’s important that you are very prepared for each LSAT sitting. If you are considering retake options, it’s best to plan for two nonconsecutive tests: For example, June and September, or July and November. 6. What’s the latest LSAT you should take? Note that November is the latest LSAT we suggest if you plan to apply to law school in the Fall of 2018 (for entrance the fall of 2019) because your score will be released in December, which is the earliest you’ll be able to apply with that score. Law schools use rolling admission so they will begin accepting applicants in September and keep accepting people until the class is full. So you want to be in the early applicant pool. 7. If you are planning to apply to any law school this fall Early Decision, then the latest LSAT you should plan to take is September. Your November score will not be released early enough for some law schools’ Early Decision deadlines. March is an important time for summer internships. There are many deadlines that are for March 1 and March 15. Some of the internships in our Winter Break Internship Newsletter over on Compass are still available, and we’ve been posting LOTS of internships on our Facebook page! Here are some tips on applications, subsequent interviews, and other important things to do to make sure you land the perfect summer internship. 1.Apply early! If you wait until the last minute to apply, you might be at the bottom of the resume stack. 4. Send a thank you note after your internship interview! Even if you think the interview did not go that well, send a thank you email and a written thank you note. You would rather be the applicant who sent the thank you note instead of the only applicant who did not send the thank you note. Do a mock interview before your real interview! The Career Center offers mock interviews. This is a great opportunity to practice with someone who can give you constructive feedback. For more information about the Career Center’s mock interviews, click here. Phone interviews and Skype interviews are very common for first round or preliminary interviews. Make sure you have a quiet environment to conduct your phone interview. If your dorm or apartment is going to be distracting or loud, book a study room for your phone or Skype interview. For information about reserving a study room through the University’s library system, click here. If you decide to do a Skype interview at your dorm or apartment, be careful of what is in the background of the video. Clean up your space and take a picture from your webcam to see what the interviewer will see. Do a practice interview over Skype with a friend to make sure you know how to use it and it works. Dress up for your Skype interview. Treat this interview as a formal interview. Wear a suit! Make copies of your application materials and bring the materials to your interview. Bring at least three paper copies of your resume, cover letter, and transcript to an in-person interview. Other Tips- Utilize campus resources! The Career Center hosts great events for finding an internship. Their next “Finding an Internship” workshop is Tuesday March 13. For more information about that event, click here. Make sure you are registered to use Handshake@Illinois. This resource helps connect you with employers looking for interns and other full time jobs. To register, click here. Get resume tips and get your resume reviewed. The Career Center offers tips for writing a resume. The Career Center also offers resume reviews. Featured Internships – These have March 15 deadlines, so apply soon! Internship with Senator Tammy Duckworth. A Congressional internship offers a unique opportunity to witness and experience first-hand the legislative process as well as assist in helping your representative or senator represent the citizens of Illinois. Click here for internship information about Senator Duckworth’s internships. The application deadline is March 15. The Wolff Internship with the Institute of Government & Public Affairs is a PAID internship starting in the summer and going through the next academic year. Applications are due March 9. The 2017 Internship Newsletter is Live on Compass! Pre-law students and alumni are starting to think about the Law School Admission Tests coming up in June and September. Note: We expect the June LSAT to fill early, based on the increased number of LSAT takers in 2017. Did you know that you can receive an LSAC fee waiver that will cover the cost of the Law School Admission Test? This blog post will share what it is, why it is important, and how to get it–as well as why you need to apply for it NOW if you plan to take the June exam. What is the LSAC fee waiver? One copy of the Official LSAT SuperPrep book (valued at $16.25). The LSAC fee waiver is even more valuable than the amounts listed above. Why? Many law schools will waive their application fees (generally $75-100 per school) for applicants who have received an LSAC waiver. Some LSAT prep companies will also offer scholarships to students with an LSAC waiver. The application process is entirely online. The LSAC advises applicants to apply at least six weeks prior to the registration deadline of the LSAT you wish to take. For this June’s LSAT, the registration deadline is May 1, and six weeks before that is March 20–the application deadline for a June LSAT waiver. But why wait? Getting your application materials in early will help ensure that you get the waiver in time and it will help you get your preferred June LSAT site. The UIUC June LSAT typically fills around spring break–but we expect it to fill even earlier this year given the increase in LSAT takers–so you’ll want to register ASAP if this test site is your preferred location. You will need tax documents, so make sure you collect those. The entire application process is explained here: http://www.lsac.org/jd/lsat/fee-waivers and you can find a helpful checklist here: http://www.lsac.org/docs/default-source/jd-docs/usfeewaiverchecklist.pdf. Still making summer plans? Here’s what to do now! What if you’re still searching for summer opportunities? You can still study abroad, get an internship/job, take the LSAT, do a pre-law summer program, participate in Illinois in Washington, or study abroad–if you get organized and apply quickly. You may recall that we posted about looking for summer internships way back in August in this blog post. It may seem crazy to apply so early, but many jobs and internships require months of lead time. Here are some great resources and next steps to take if you are still looking for summer opportunities. 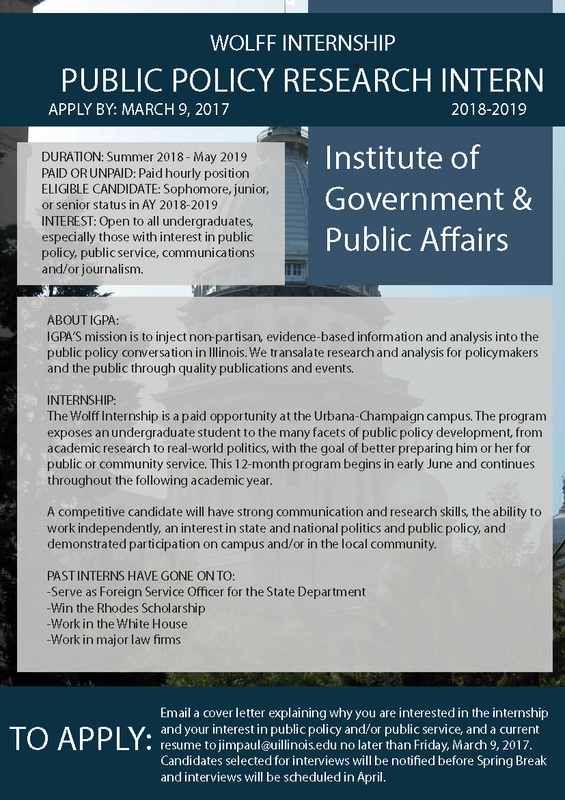 Illinois in Washington–summer applications are due Feb. 1, and you’ll need a resume review and 2 recommendations, so this deadline is pressing. Explore their website and find application details here. Summer (or fall) study abroad— February 15 is the application deadline for most Summer 2018, Fall 2018, and Academic Year 2018-19 programs. Check out Study Abroad’s First Steps info here to begin identifying programs and applying for summer opportunities. Taking the June LSAT? Registration is open here! Register early to get your preferred test site. This one will fill! Now is also the time to register for an LSAC fee waiver. See this week’s other blog post for more fee waiver info. Summer pre-law programs–many application deadlines are in March and April. We posted about these in our internship newsletter and also in recent blog posts like this one. Did you know that you can get a scholarship for working at an unpaid internship this summer? Apply for the Fred S. Bailey scholarship here, which provides a $1000 stipend for part-time internships and a $2500 stipend for full-time summer internships. Applications due April 12, so you still have time to find an internship before applying. Explore our Internship Newsletter (over on our Compass page) which we posted over winter break–many of those deadlines are coming up in February and March! Use Handshake. The Career Center switched from I-Link to Handshake last summer. Click on the link below, log in, set up your profile, explore, and set it to contact you when internships you qualify for become available. Check back regularly. Attend Career Fairs. Did you know that most campus career fairs, like the Business Career Fair and the ACES Career Fair, are open to all students? And, many of those employers will have both job and internships available. Mark your calendars for the upcoming Business Career Fair and the Just-In-Time All Illini Career Fair this spring. You can find a list of all campus career fairs on Handshake (link below). Check out the Career Center’s workshops on preparing for the fairs. Create or perfect your resume. The Career Center has numerous opportunities to have your resume reviewed–or attend a resume basics workshop–every week. Click here to see their events. You’ll need a resume for the rest of your life, so the sooner you start building these skills, the better! Aim to have a good quality resume ASAP to avoid delay applying for the opportunities you find. Calendar it. NOW–right now–go to your Gcal, ical, or good old fashioned planner, and schedule a few hours each weekend for Internships. (Use this time to check internship listings and prepare your applications.) When you find an internship listing, add that due date to your Gcal/ical/planner too. Finding and applying for internships and jobs is not done in an afternoon–it really helps to be organized and persistent. Apply for Summer 2018 pre-law programs. In addition to those we listed in our Internship Newsletter, we’ve also posted a spreadsheet of pre-law summer programs over on our Compass page with links and application details. Note: Many scholarships are available to incoming 1Ls even if you don’t know which law school you are attending yet, like this one, so it’s still a good time to apply for them. Apply for Summer 2018 Study Abroad programs. Now is the time, as many summer study abroad program deadlines are in January/February like this Rome trip about Italian healthcare (due Jan. 15) or this ACES in Argentina program. Explore all available summer programs on the Study Abroad website. Explore the Top Scholars website here–they offer lots of opportunities like these upcoming scholarships: UK Summer Fulbright, Boren, and Gilman scholarships. Did you know that you can get a scholarship for writing one tweet? Or making a 2 minute video? Or being left-handed? Check out our 275+ Scholarship Spreadsheet–listing ALL kinds of scholarships, not just essays–over on our Compass page. Draft or update your resume to reflect what you accomplished this semester. These Career Center resources on drafting resumes can be helpful. Clean up your social media/online presence. When you apply for jobs, internships, or graduate school, many people will Google you or review your social media sites, so make sure they are appropriate for those audiences. Take down anything questionable, un-tag yourself, and double check your privacy settings. Informational Interviews. While you have some free time, take the opportunity to reach out to local lawyers and get some insight into legal careers. Ask if you can take them to coffee and chat about their careers. For more details on how to conduct the interview use this Career Center resource. A great book providing insight into lots of different legal careers is 24 Hours with 24 Lawyers by Jasper Kim. Legal websites and blogs abound. Here are popular legal sites where you can learn about hot legal issues and about the legal profession. LawProfessorBlogs.com Want to get a peek into the world of law professors and the topics they consider important? This site provides a directory of many different blogs by topic area and includes everything from Adoption Law to White Collar Crime and everything in-between. Listen to podcasts–there are tons of great legal podcasts out there, including these. I Am the Law presents interviews with all different types of lawyers, from environmental lawyers to prosecutors to family law and corporate. Serial provides an in depth view of the nuance and challenges of prosecuting crimes as each season analyzes one criminal case. Women in the Law. This special short-term series explored issues of particular relevance to women in the profession. The Girl’s Guide to Law School–Don’t be fooled by the name; this is not just for girls! This podcast is relevant for everyone interested in law school. With topics ranging from Will Law School Be a Disaster to Which Law School Should I Go To to explaining OCI (an interview process for law students) to Avoiding Disasters in Law School to how to read cases, this podcast truly has something for everyone. Finish those applications. It is time to get them in! Plan your law school visits–many schools will have open houses or visit days in January and February. This may require pre-registration and some travel that you’ll want to plan in advance. Follow your law schools on social media if you’d like to know when they are making decisions or scheduling open house/admitted student events. Make a Pre-Law Advising appointment–If you have application questions or want some feedback on an essay, you can make a phone or Skype appointment if you’re not in the area. Here is our appointment availability over winter break. Appointments with a pre-law advisor are available through December 21. Appointments will be available again January 2 through January 12. Our regular schedule will resume with the Spring Semester on January 16. Fall Break is here — now what? Aside from relaxing, eating and watching football (and maybe getting ready for finals?! ), what else could/should you be doing? If you are done with the LSAT, finish your applications! If you have everything you need to apply there is no reason to procrastinate. This is a rolling admissions process — file your applications ASAP! If you are taking the December LSAT — keep studying! A strong LSAT score helps both with admissions and scholarships! Set some goals for how many practice LSATs you can take over break and stick to it. If you are waiting on Letters of Recommendation, gently remind your recommenders (either via a phone call or email) that you want to submit your applications ASAP but cannot do so until LSAC/CAS receives all required letters of recommendation. DePaul Law is hosting an Open House on Saturday, November 18. Click here for more details. For those of you applying to the University of Chicago, they will be holding an open house on Monday, November 20. Click here to register for this event. Check deadlines for Early Decision! While many schools list November 15 as their early decision deadline, several others allow early decision applications until December 1 or even Dec. 15. Not sure about early decision? Click here for a PLAS blog post on the pros and cons of applying early decision. Did you know that you can already apply for scholarships sponsored by non-university sources? Take a look at the scholarship spreadsheet with over 250 options over on our Compass page–these have a variety of due dates and many are due by the end of the calendar year, so now is a great time to apply! Study for finals and write those papers! Your GPA is a very important part of the law school admissions and scholarship process! LSAT Prep. In general, we advise those planning to apply to law school next fall to take the June 2018 LSAT (unless study abroad prevents you from doing so). You should plan to spend approximately 4-6 months studying for the LSAT–so now is the time to prepare for that process. As you plan your schedule for Spring 2018, consider not overloading on courses since the time necessary for effective preparation equates to the time invested in a rigorous 3 credit class. Remember: the LSAT is NOT like the ACT or the SAT. It does not test you on what you know. Rather, it tests how you think. It is important to determine how you plan to study for the LSAT (on your own, through a commercial prep company, etc. ), and decide where you want to take the LSAT. To begin your research, go to the LSAC’s website for info on the LSAT, how to register and select a test site, and how to be successful on the test. Apply for Internships — Have you thought about what you will be doing next summer? Are you looking into internships? Internships can be a great way to learn more about the legal system and the practice of law. Do you need some suggestions on how and where to find an internship? Check out this 2018 Internship Plan from our blog. We also recently posted several internships to our Facebook page. And remember: the PLAS Annual Internship Newsletter will be out and published on Compass the week of December 18! Network and conduct informational interviews. A great way to start to build your professional network and get to know various legal practice areas is to meet with lawyers! Do you or your parents know any lawyers? Are any of your friends’ parents lawyers? You can also use the alumni association directory to identify Illinois alumni who are lawyers. Ask a lawyer to spend 30 minutes doing an informational interview with you. Don’t be intimidated; this is an opportunity for you to buy him/her coffee and ask about their professional life. Here’s a resource for planning your informational interview. Apply for scholarships! We’ve included lots of scholarships for continuing undergraduate students. Take a look at the scholarship spreadsheet with over 250 options over on our Compass page–these have a variety of due dates and many are due by the end of the calendar year, so now is a great time to apply! Here are a few great undergrad scholarships with upcoming deadlines. Find these and over 200 more on our Scholarship Spreadsheet! Ai Engstrom National Scholarship application is due December 1. Bankruptcy Law Center Scholarship Contest application is due December 20. A Better America Scholarship Program application is due December 31. Whether you’re looking for scholarships, internships, recommendations, LSAT tips or spring courses, we’ve posted about it on the blog! Here is a handy roundup of the Best of the Pre-Law Blog in case you’ve missed some of our most helpful posts. Did you know…that you can search the blog using the search box in the upper right? Planning your Spring 2018 schedule? Visit this blog post for course suggestions, then visit this blog post for other considerations in planning your schedule. Looking for scholarships? Check out this post with details about our Scholarship Spreadsheet listing over 250 scholarship opportunities. Trying to find an internship? Explore this post and GET GOING! A Spring/Summer 2018 Internship Plan–Starting NOW! You should also join our Facebook page, where we post internship and job opportunities for pre-law students. Currently applying to law school? Whether you’re taking the December LSAT or you’re done with the LSAT and wondering what to do now or you’re looking for letters of recommendation (see Tips on getting recommendations from someone who writes them), we have those and many other posts to help you through the application process. Planning ahead for taking the LSAT in 2018? Great! Go immediately to this post on Big LSAT changes: What should you know? Also take a look at Timelines for 2018 LSAT Takers. Thinking about summer 2018 plans? Planning ahead is smart. Explore this Summer Pre-Law Programs post, and head over to our Compass page to see the Summer Pre-Law Programs tab, containing a spreadsheet with 46 pre-law summer programs. Also consult our internship resources mentioned above.